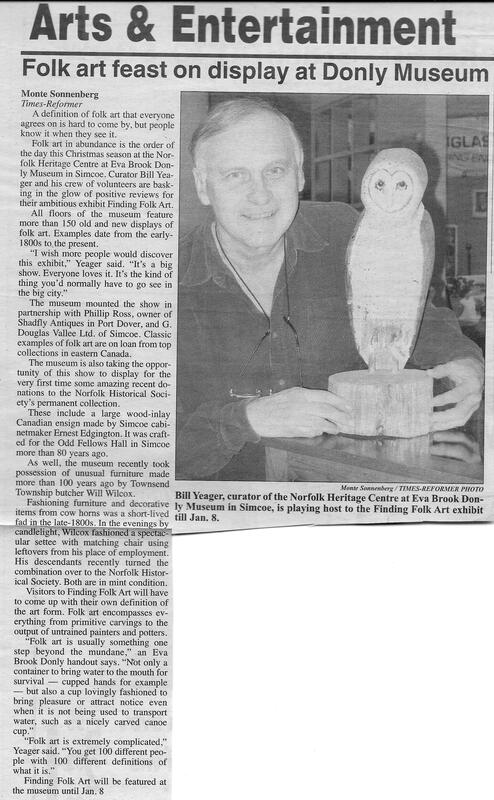 In 2005 I was the president of the Norfolk Historical Society, which was a small group of dedicated people working to keep the Eva Brook Donly museum open in our local town of Simcoe. The society was founded in 1900, and opened the museum in a lovely old home bequeathed to the town in 1946 by local artist and philanthropist, Eva Brook Donly. She and others had left some money to keep the place going but by the year 2000, and with the end of a lucrative bingo fund raising business, the museum and society was falling on hard times. We had a very good curator in Bill Yeager who ran the place well with a very small staff, but although Norfolk county looked after the building, we were independent of them otherwise. So it was up to the board to try to come up with interesting exhibits that would capture a good turn out and hopefully in the process make some money and gain new supporters. With my background in folk art, I suggested that I would be willing to curate and mount a folk art exhibition as our major show of the year. No budget to speak of, and based only on the knowledge that I knew a few large collectors well enough to lean on them for loans, I forged ahead. It was also something I had always wanted to do. 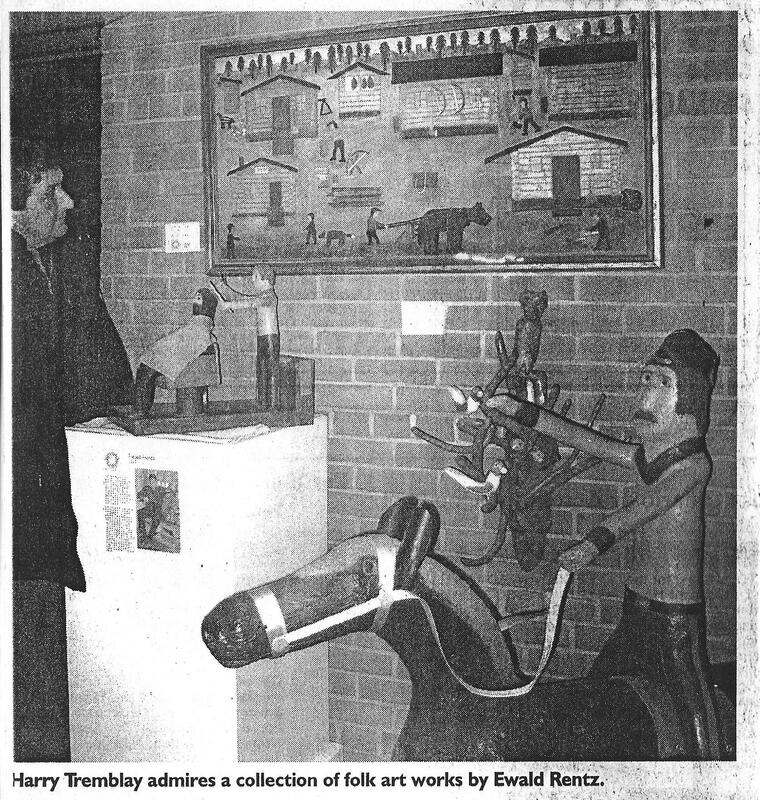 So I, along with Bill, and a half dozen other dedicated board members worked our butts off and called in a dozen favors, and we pulled off a first class folk art exhibition which garnered a lot of attention and even ran a couple of weeks longer than planned due to popular demand. We didn’t make enough money to save the museum, but we were all happy and proud of what we were able to pull off. Here’s a sampling of the local press reports at the time. Some interesting insights. “Artist striving to be different would have nothing on Billie Orr. Born in a log cabin near Purbrook Ont., Orr continued to live there after his parents died, without electricity or running water. Motivated to create, he made cement works of art including an elf and a cat with large paws. Phil Ross, owner of Shadfly Antiques used to travel to buy Orr’s pieces which the artist made him buy one by one. 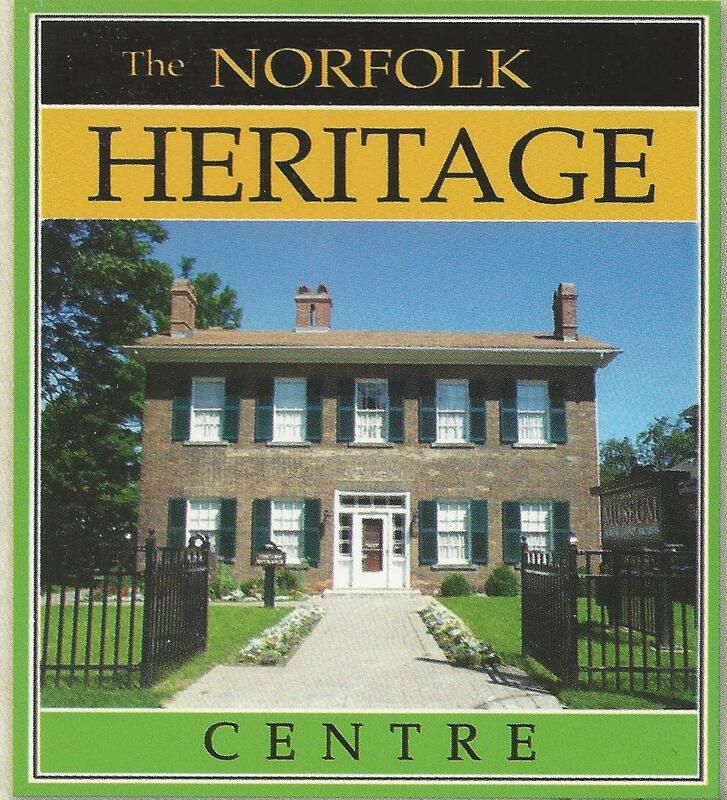 “I’m amazed that virtually everyone who comes through the door seems to love the colour and the humour, and the accessibility’ Says Yeager, director of the Norfolk Heritage Centre. 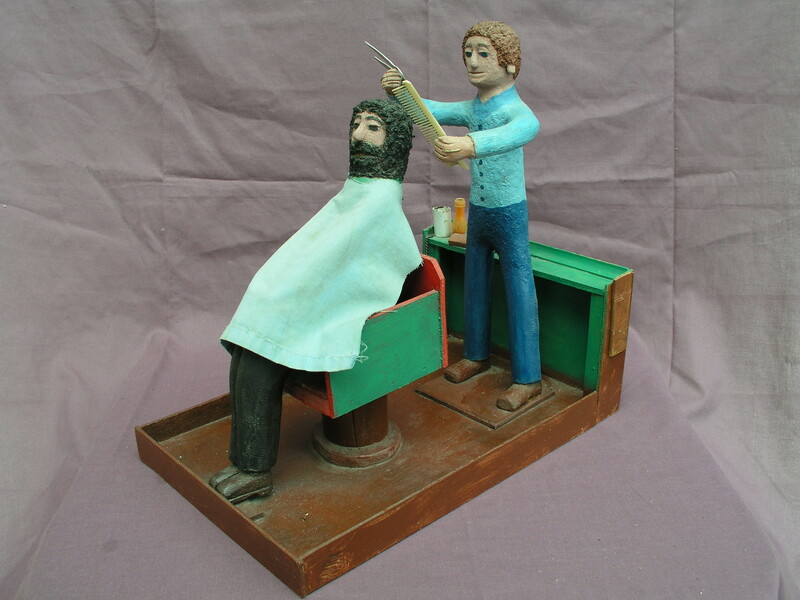 A definition of folk art that everyone agrees on is hard to come by, but people know it when they see it. Folk art in abundance is the order of the day this Christmas season at the Norfolk Heritage Centre at Eva Brook Donly Museum in Simcoe. Curator Bill Yeager and his crew of volunteers are basking in the glow of positive reviews for their ambitious exhibit, “Finding Folk Art”. Ewald Rentz cutting Norval Morrisseau’s hair. And it’s true. Thanks to the generosity and trust of a few good collector friends, we were able to put together a first class exhibit that was both comprehensive and well documented. We had a lot of wonderful items. 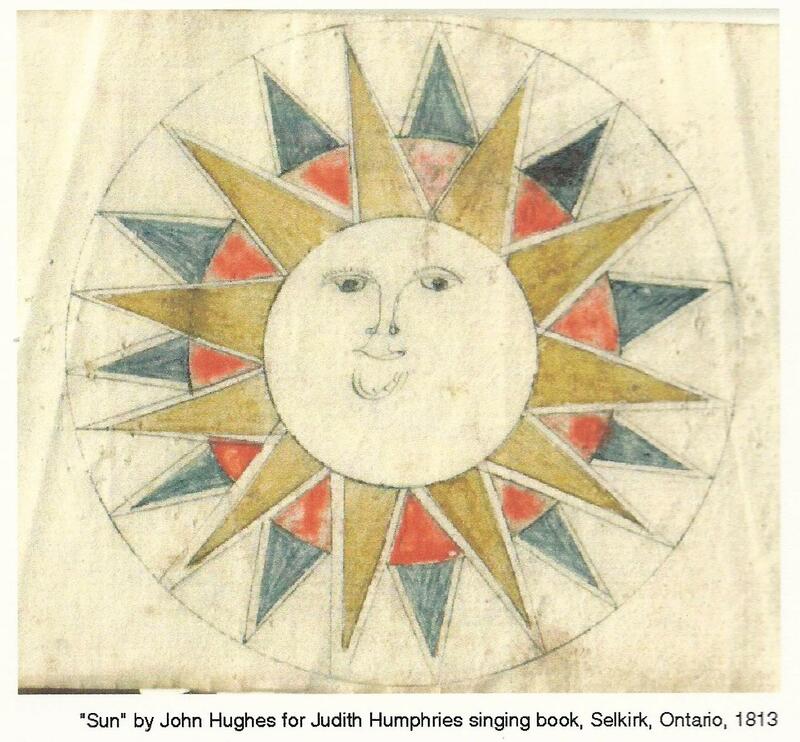 An 1830’s singing book featuring lovely hand painted sketches. 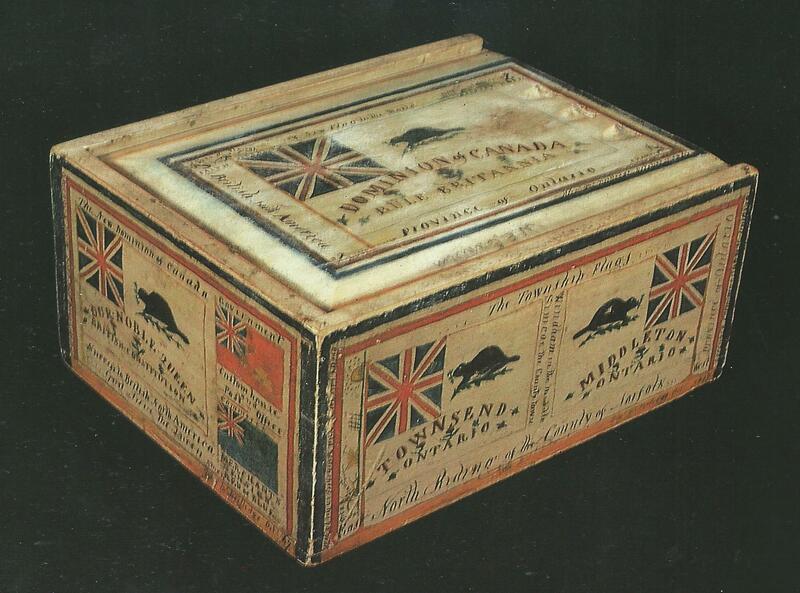 An absolutely incredible, and important 1867 Confederation box created by Port Dover’s Captain Alexander McNeilledge. A hand painted candle box depicting flags and beavers and minute whimsical inscriptions along the border such as : Captain Alex. McNeilledge -76 years- Use no specks – Chew no tobacco – Take only a wee drop as required”. A few Maud Lewis and Joe Norris Paintings. Many works by all the greats, Ewald Rentz, Wilfred Richard, Leo Fournier, the list goes on and on. All catalogued, with short informative labels, and all well-lit, and displayed effectively. It really was an enormous amount of work, but when all was said and done, and we walked through the galleries looking at the results of our efforts, we all felt enormously happy and proud, even if it was all just for a local audience. It would have been nice if we could have garnered some attention from larger places like Brantford, Hamilton or Toronto. We tried sending press releases to all the larger media outlets, but heard nothing back. That’s the way it is. And you never know who you may have an effect on. We may have encouraged some young local talent. We certainly gave those who saw it, something to think about, and celebrate if they were so inclined.